According to Hinduism, Lord Shiva is the God of all Gods. He is omnipotent, and is the source of all power in the Universe. Also known as the destroyer, He represents darkness and is said to be the 'angry god', when he opens His third eye for destruction. Idols and seals of Lord Shiva has aso been found in the remains of the ancient civilization of Mahenjodaro and Harappa. According to Hinduism, creation follows destruction. Therefore Shiva is also regarded as are productive power, who restores what has been dissolved. His most common depiction is as a dark-skinned ascetic with a blue throat. The river Ganga cascades out of his matted hair and he is surrounded by serpents. He is carried by his ox, Nandi. 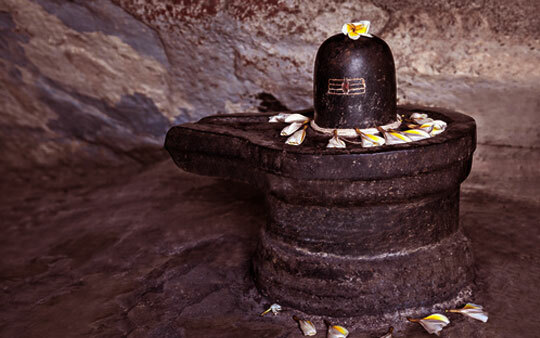 The Linga, or the Shivalinga, is the most popular manifestation of the lord, and is represented by a phallus. Linga means 'sign, mark, or symbol'. The Shivalinga is a symbol of cosmic energy and creation. It is phallus shaped and fixed on a base. Though Shiva is considered the Destroyer, according to Hindu belief, creation follows destruction. The linga is therefore associated with the sexual union of Shiva and Parvati, which results in creation. It is a symbol of the procreative power of the universe. It is also sometimes referred to as linga. One of the Puranas (ancient scriptures of Hindu literature), a collection of 18books which consist of short stories and narration explaining the complicated concepts of the Vedas. It eulogizes Shiva. He is also called Mahayogi, or the great ascetic, who symbolizes the highest form of austere penance and abstract meditation, which results in salvation.